Top Contributors - Oyemi Sillo, Claudia Karina, Anna Jansma, Evan Thomas and Kim Jackson ­ Your name will be added here if you are a lead editor on this page. Osteoarthritis intion young people has two components: osteoarthritis, which means inflammation (itis) of the joint (arthro) and bones (osteo); the second component, namely young people is harder to define because young is a relative conception. It is considered that young people in combination with osteoarthritis mean that patients are not older than 55 years of age. Primary osteoarthritis: is the form where you don't know what could have triggered the disease, inferring history or clinical/radiographic examination. Overweight: Obesity in children and adolescents has been linked to musculoskeletal disorders, therefore, excess force or joint loading may lead to osteoarthritis in overweight teens. Sports participation/occupation: High-impact, high-intensity, and repetitive athletics have a strong association with OA. Power and team sports such as soccer, basketball, track and field, boxing, wrestling and weight lifting have been linked with the development of early-onset OA. These risk factors may lead to the development of premature osteoarthritis in a genetically susceptible person. Genetic predisposition: more than 50% of all cases of OA result from a hereditary disposition. The interleukin-1 gene cluster, a key regulator in several chronic disease processes, conferred a twofold risk of OA in those with a specific genotype. These findings support that OA is not just a disease of the older people. The most common joint site for OA is the knee. followed by hand, hip and in fourth place the ankle. Ankle OA is most often a result of trauma and is associated with chronic ankle instability. Pain is more likely caused by congenital hip dysplasia, athletic injuries, trauma, spondyloarthropathy, and by conditions that first appear during this stage of life, such as rheumatoid arthritis, osteoarthritis, intravenous drug use, alcoholism, or corticosteroid use. Furthermore the more common characteristics of generalized osteoarthritis can be found in the young adult, mainly in the Hip and Knee. The diagnostic procedures for young people suffering from osteoarthritis is not different from people who are older. There are guidelines for diagnosis of different types of osteoarthritis, like hip and knee osteoarthritis. Main focus in both (and thus also in young patients) is the evolution of pain. The diagnosis itself is confirmed by radiography. In young subjects, however, some of these tests should be adjusted for the age: difficult terminology should be avoided in questionnaires, score outcomes should be compared with subjects of the same age and exercise difficulty should be appropriate for the subject. Inspect posture and movement in daily activities, with special attention for the back, pelvis, ankles and feet. If walking aids are used, the upper extremity must also be inspected. Palpate for presence of swelling or raised temperature and muscle tone. This is in agreement with another finding that says that the following physiotherapy techniques are valuable therapeutic adjuvants for the treatment of osteoarthritic symptoms. Massage: Following KNGF-guidelines massage has lost its place to exercises, which should be the cornerstones in all therapy for OA. 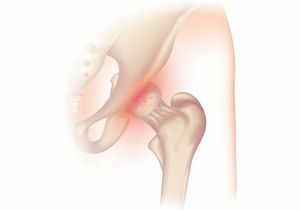 The goal of the differential diagnosis of hip pain is to identify the location and underlying mechanism of the pain. An accurate history and physical examination may indicate whether the pain is intra-articular, extra-articular, or referred from more distal locations. Additional laboratory or imaging tests may be necessary to determine the exact cause. Fractures, infection, and ischemic necrosis should be ruled out early because they require immediate treatment to prevent damage to the joint. The prevention of development of osteoarthritis in the adolescent can be achieved by reducing risk factors. Physiotherapists can promote the maintenance of a healthy weight, low-impact activities, giving exercises to improve joint stability to prevent joint injuries. They can have influence by preventing further progression or complications of a disorder and improving the patient’s self-efficacy. In case of malalignments (leg-length discrepancy, varus/valgus, etc.) young patients should be referred to a podiatrist for insoles to prevent the development of OA (in the hip or knee) at an older age.